CHICAGO — When a new laundry opens in your area, how do you react? Are you anxious about the impact it will have, or are you unfazed because you’re confident in your own operation? 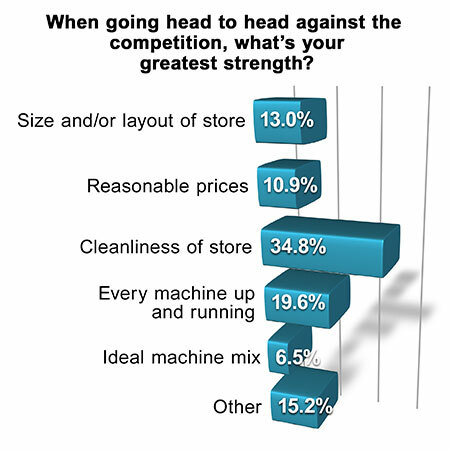 This quarter’s American Coin-Op Your Views survey asked coin laundry owners about sizing up the competition. More than 41% of respondents to the unscientific poll say they don’t fear competition, but the remainder do in one respect or another. 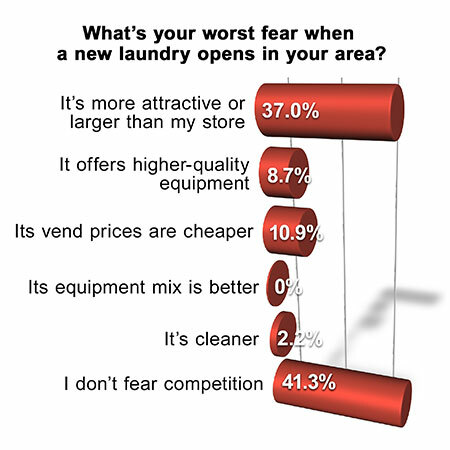 For 37% of respondents, their worst fear is that the new laundry is “more attractive or larger than my store.” Vend prices that are cheaper than theirs concerns 10.9% of respondents the most. Another 8.7% fear the new store offering higher-quality equipment, and 2.2% are afraid it will be cleaner than theirs. Have you ever personally visited a competing laundry to get a sense of its operation? Based on our survey results, the likely answer is yes. Among respondents, 93.5% admit to having visited a competitor’s store. If a “good” laundry opened near them this week, 63% believe they would take a “mild hit.” Roughly 24% say they would “lose little, if any, business,” and 4.4% “would lose no business.” Only 2.2% believe they “would take a major hit.” Roughly 7% aren’t sure how the opening would impact them. Roughly 41% of respondents believe there are too many laundries in their area, 43.5% say there are not, and 15.2% are unsure. The remaining 15.2% of respondents see something else as their greatest strength. In many cases, they say all of the previous points combine to be their greatest strength. Location, attendants on site 24/7, and larger machines were also mentioned among the “other” choices. While American Coin-Op’s Your Views survey presents a snapshot of store owners’ viewpoints at a particular moment, it should not be considered scientific. Qualified subscribers to American Coin-Op e-mail blasts are invited to participate anonymously in the industry survey.